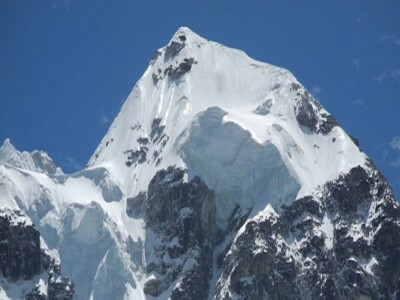 Mera and Island Peak are two famous peaks climbing in the Khumbu region. 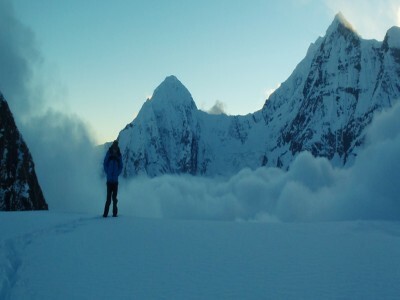 Mera and Island peaks combined with the Amphu Lapcha Pass trek provides a challenging and exciting expedition. 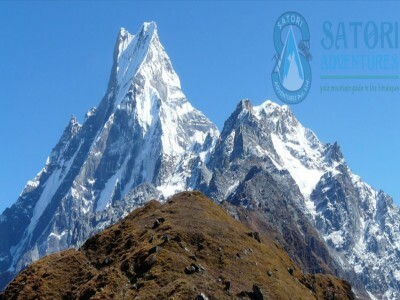 It gives the highest quality trekking and climbing experience that is available in Nepal. 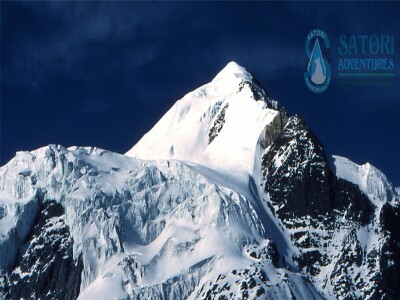 Mera Island Peak climbing is an exceptional high altitude Himalayan adventure. The routes are classic and the position is both aesthetic and exposed. Mera Peak is situated Northeast of Lukla, after a 30 minute scenic flight from Kathmandu to Lukla, where the treks move toward Chutanga & Tangnang villages. 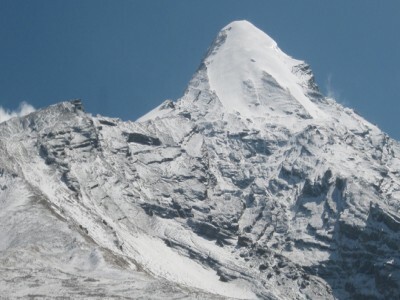 Island Peak is both lower in altitude than Mera Peak and technically demanding. 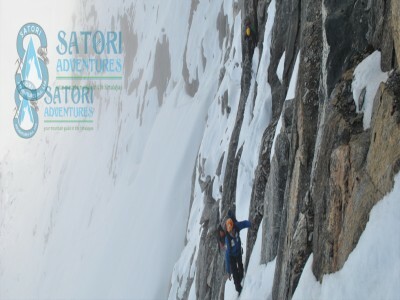 It involves climbing 45 degree snow slopes and an exposed summit ridge. 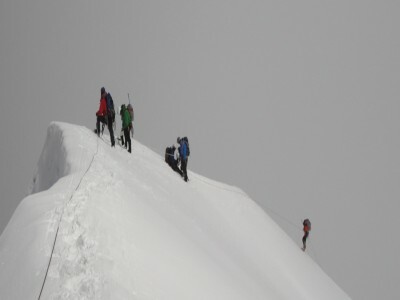 After Mera peak you move onto the easier Mera Peak summit. Following that ascent you head east exploring the less travelled route toward Makalu Base Camp in the wilderness of the Honku valley. 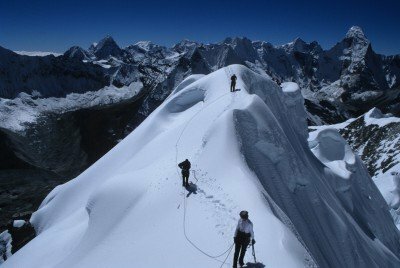 You have to cross Amphu Lapcha pass which is at an elevation of 5700m to reach Island Peak base camp. 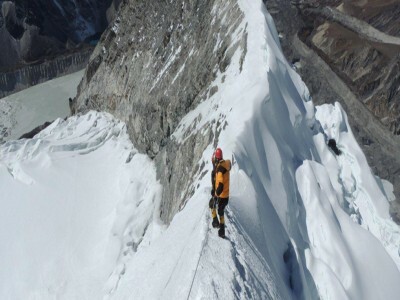 The Panoramic summit of Island Peak climbing is a wondrous view that will stay in your memory forever. After the Mera/Island peak combo you will trek down through Pangboche, Tyangboche monastery, Namche then back to Lukla. It will take 28 days to finish the entire expedition. The perfect season to climb in this trail is during the spring (March to May) and during the fall (August to October). 05 Oct/Day 01: Arrival in Kathmandu Airport and transfer to a hotel in Kathmandu (1350m/4,430ft). 06 Oct/Day 02: Preparation, briefing and Last minute shopping in Kathmandu. 07 Oct/Day 03: Morning flight from Kathmandu to Lukla(2800m/9,186ft) 35mins.The rest of the day is spent in Lukla for acclimatization. Lodge accommodation. 08 Oct/Day 04: Trek from Lukla to Chutanga(3050m/10,006ft) 04hrs. Lodge accommodation. 09 Oct/Day 05: Trek from Chutanga to Thuli Kharka (Chatra-La) (3900m/12,597ft)- 7hrs via Zatrawa La Pass (4610m/15,125ft.) Overnight accommodation at tea house. 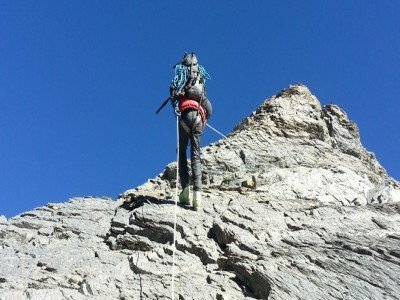 10 Oct/Day 06: Trek from Tuli Kharka to Kothe (4095m/13435ft-05hrs.) overnight at tea house accommodation. 11 Oct/Day 07: Trek from Kothe to Thangnak (4350m/14,272ft)- 04hrs. Tea house accommodation. 12 Oct/Day 08: Rest and acclimatization day at Thangnak(4,350m/14,272ft). You will be exploring Sabal Tsho Lake in the day as a sight trip. 15 Oct/Day 11: Mera peak Summit Day. 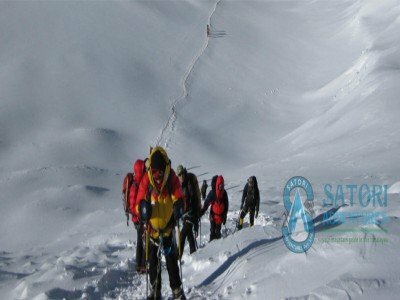 Mera High Camp to Summit and Trek down to Kongmanima (5220m/17,125ft). 11-13hrs. 16 Oct/Day 12: Trek from Kongmanima to Seto Pokhari (4500m/14,763ft.) -06hrs and overnight Camping accommodation. 17 Oct/Day 13: Trek from Seto Pokhari to Amphu lapcha base camp (5,600m/18370ft) -07hrs, Camp accommodation. 18 Oct/Day 14: Trek from Amphu Lapcha South Base Camp to Amphu Lapcha North Base camp(5200M/17060ft.) via Amphu Lapcha pass (5,845m/19176ft.) 8-9hrs, camping. 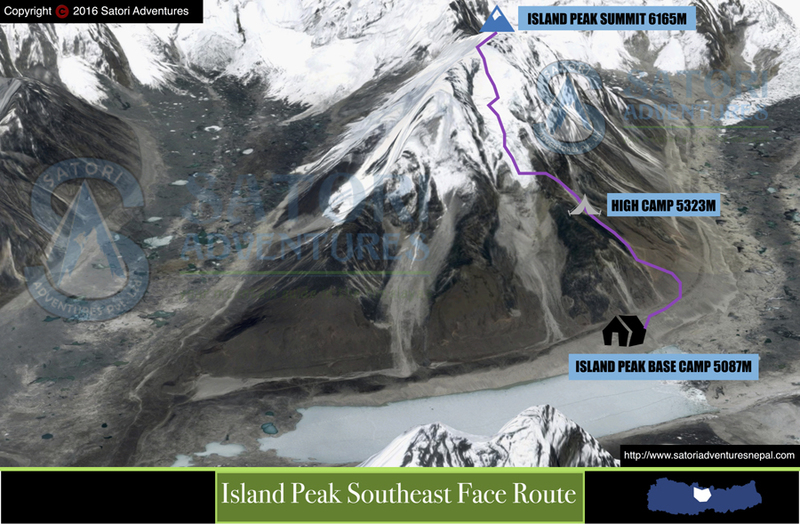 19 Oct/Day 15: Trek from Amphu Lapcha north Base camp to Island Peak base camp (5,087m/16690ft. )-04 hours preparations for climbing Island peak. 26 Oct/Day 22: Leisure day and Shopping in Kathmandu. Fair well celebration dinner with culture program in the Evening. 03 May/Day 01: Arrival in Kathmandu Airport and transfer to a hotel in Kathmandu (1350m/4,430ft). 04 May/Day 02: Preparation, briefing and Last minute shopping in Kathmandu. 05 May/Day 03: Morning flight from Kathmandu to Lukla(2800m/9,186ft) 35mins.The rest of the day is spent in Lukla for acclimatization. Lodge accommodation. 06 May/Day 04: Trek from Lukla to Chutanga(3050m/10,006ft) 04hrs. Lodge accommodation. 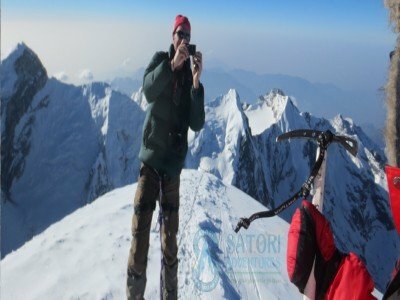 07 May/Day 05: Trek from Chutanga to Thuli Kharka (Chatra-La) (3900m/12,597ft)- 7hrs via Zatrawa La Pass (4610m/15,125ft.) Overnight accommodation at tea house. 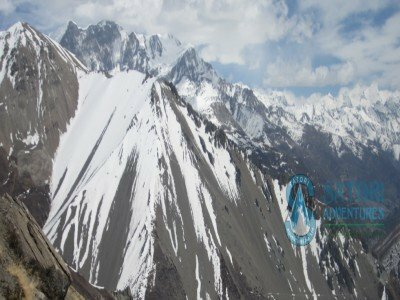 08 May/Day 06: Trek from Tuli Kharka to Kothe (4095m/13435ft-05hrs.) overnight at tea house accommodation. 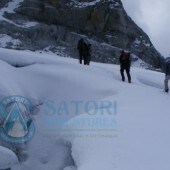 09 May/Day 07: Trek from Kothe to Thangnak (4350m/14,272ft)- 04hrs. Tea house accommodation. 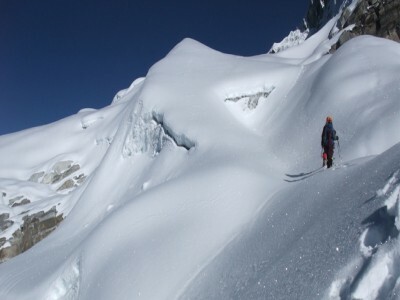 10 MayDay 08: Rest and acclimatization day at Thangnak(4,350m/14,272ft). You will be exploring Sabal Tsho Lake in the day as a sight trip. 13 May/Day 11: Mera peak Summit Day. Mera High Camp to Summit and Trek down to Kongmanima (5220m/17,125ft). 11-13hrs. 14 May/Day 12: Trek from Kongmanima to Seto Pokhari (4500m/14,763ft.) -06hrs and overnight Camping accommodation. 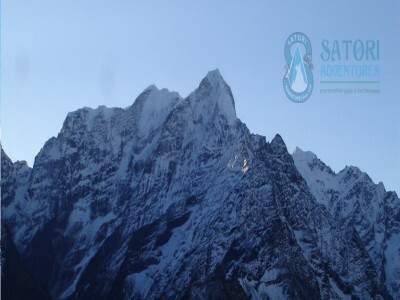 15 May/Day 13: Trek from Seto Pokhari to Amphu lapcha base camp (5,600m/18370ft) -07hrs, Camp accommodation. 16 May/Day 14: Trek from Amphu Lapcha South Base Camp to Amphu Lapcha North Base camp(5200M/17060ft.) via Amphu Lapcha pass (5,845m/19176ft.) 8-9hrs, camping. 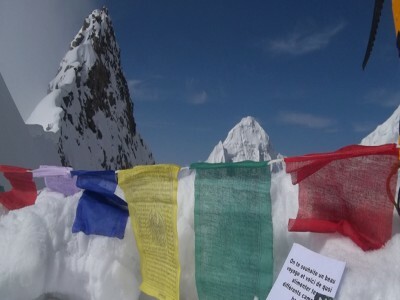 17 May/Day 15: Trek from Amphu Lapcha north Base camp to Island Peak base camp (5,087m/16690ft. )-04 hours preparations for climbing Island peak. 24 May/Day 22: Leisure day and Shopping in Kathmandu. Fair well celebration dinner with culture program in the Evening. 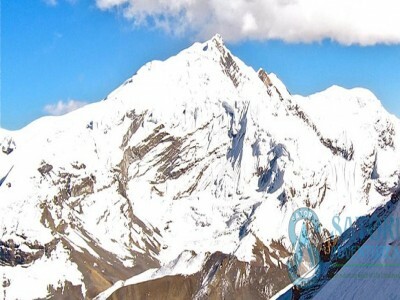 Schedule flight tickets Kathmandu-Lukla-Kathmandu to all the climbing members & Sherpa guide. 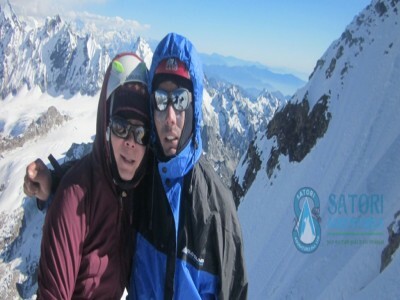 All trekking and mountaineering equipment available During thr trekking and climbing. 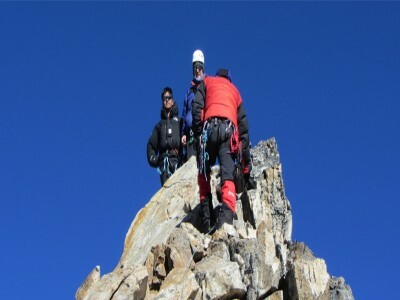 Services of chef and kitchen assistant at camping parts and climbing parts at base camp. 3 fresh meals a day: Breakfast, lunch and dinner will be served at base camp and camping trekking. 20kg baggage allowance per person during trekking and climbing carried by porters/yaks. Trekking permit (Everest and Barun valley national park entry fee). 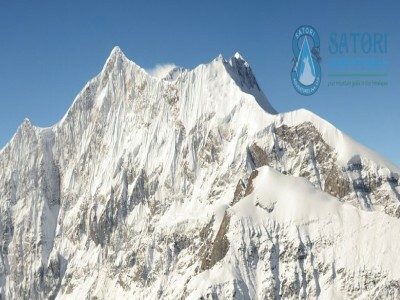 Expedition royalty and climbing permit of Nepal government to climb Mera peak and Island Peak. 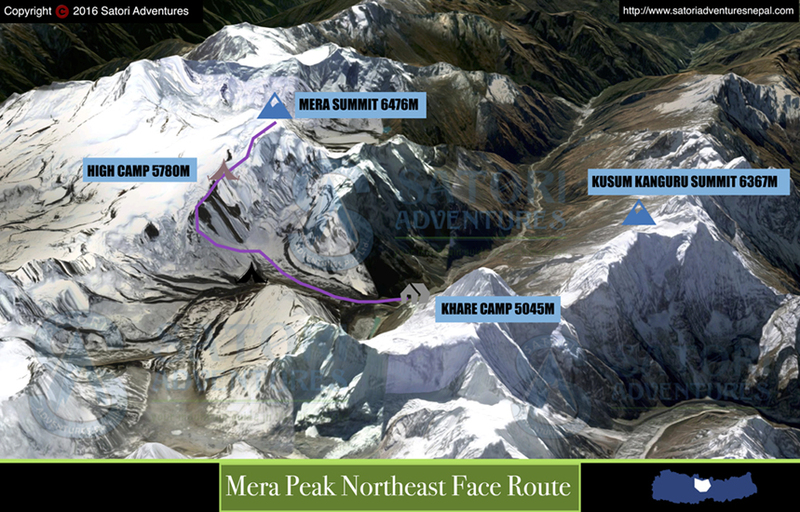 Trekking and climbing map of Lobuche peak. Expenses incurred towards usage of landlines, mobiles, walkies-talkies, satellite phones and internet. Panoramic view from Island and mera peak summit.